Special Shout-Out to North Jackson Elementary! ©Savanna. All rights reserved. Used with permission. Now that my daughter, Morgan, is a teacher, it's a special treat to know her students enjoy my books in the classroom! While WOLVES is no longer in print, I'm glad to know it's still a hit with young readers, and I'm always happy to supply a copy to schools I visit. Wolves are captivating animals, regardless of books about them! One of Morgan's third-graders from last year, Savanna, took a special interest in wolves and made these gorgeous pictures. 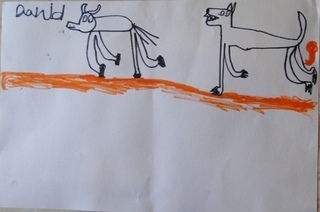 I appreciate how she not only captured the expression of these wolves but paid attention to details, like the curve of an ear, the direction of fur, and the variations in its shading. I just love these drawings. Many thanks to Savanna, now in fourth grade, for sharing her work with us! Below are some sample works of fourth grade students. Over several days, they went on a "haiku hike" - making observations in their journals - and then wrote, revised, illustrated and published their work poems. For all the terrific student haiku from this project, click these two blog posts to read them! 2011 Zoofari Campers Isabel and Bonamy made these great wolf masks at the Chestatee Wildlife Preserve. Second-grader Dawson from Florida drew this picture of Sir Mike (2010). See who is hiding behind the bushes?